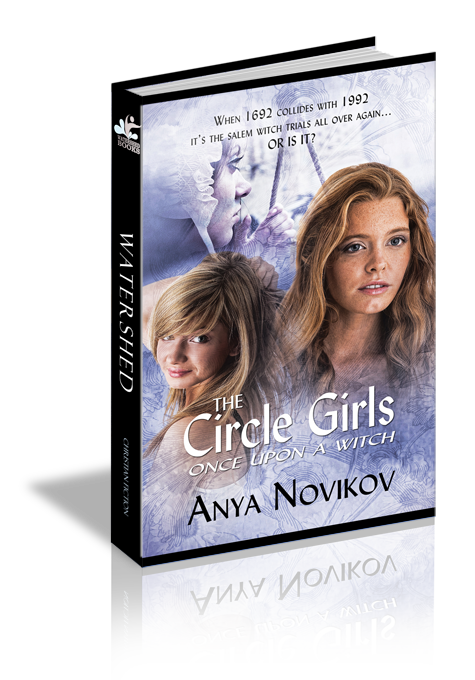 God will give you blood to drink. . .An ordinary teenager finds out what witch-hunting is all about—in her own everyday world. Deliverance “Delli” Willis, a normal, almost-sixteen-year-old, finds herself dreaming wild dreams about a girl in 1692 who is also named Deliverance. And then, to Delli’s amazement, the stuff of dreams appears in her classroom unit on the Salem Witch Trials! Is it just a coincidence when 1692 Deliverance finds herself entranced by a mysterious man in the woods, and then Delli finds a new and mysterious neighbor walking through her family avocado grove? Or when her dreams uncover similarities between both mystery men…and more? Delli’s not sure what to believe, but she’s eager to share the handsome newcomer with her circle of friends. What she doesn’t realize is the danger of someone unique entering the closed loop. collides with 1692 in ways Delli never dreamed. It will take lessons from her dreamscape and a stand against bullies to tighten Delli’s faith in God and pull her through some trials of her own. God will give you blood to drink. The witch’s curse still hung in the air a whole day after the executions. Even though the strange wind from the bay was hot and dry, Deliverance shivered. From underneath the edge of her white cap, she stole a secret glance at the empty tree on Gallows Hill. Of course, she had witnessed the executions. It was a good morality lesson. The court had determined children should attend. Once again, her stomach churned. The witches now lay in hasty graves. But all night long, she had seen their twitching bodies behind her eyelids when she tried to sleep. Judge Noyes must be shaking in his boots. One witch had cursed him. I am no more a witch than you are a wizard...If you take my life away, God will give you blood to drink! Truth to tell, Goodwife Sarah Good hadn’t seemed much of a witch. A slothful beggar to be sure. But the girl chewed her lip in thought. Perhaps the court had been right to condemn her. Goody Good’s filth had brought the smallpox. Well, Deliverance lived a proper life, and she had taken no part in the accusations. Relief skimmed her. Although Ann and her other friends had. What hung from the branches now? Fruits shaped like pears but deep dark green with rough bubbled skin like a frog? She rubbed her eyes and the vision disappeared. The wind turned suddenly moist and cold. Icy fingers climbed up the ladder of her spine. Had they been witches after all? Hadn’t the witch of Endor conjured the image of the prophet Samuel for King Saul, those ancient centuries past? Her stomach churned. Had not the prophet Isaiah explained that spirits and powers of the dark could peek into man’s affairs? She rubbed her eyes another time. What was this strange fruit with the skin of frogs hanging where five witches had met their judgment? Some corruption from the Tree of Knowledge of Good and Evil? Everyone knew that frogs and toads were diabolical. The Book of Revelation said so. Why would she imagine such a wicked thing? Unless she herself was bewitched. But no. She could not be. There was no bewitchment. Her mother had explained it. Just jealousies and resentments against neighbors, suspicion against things not understood. Distrust for those who did not follow the rules. The accusations were all falsehoods. She and her honored mother had discussed this very thing just two nights ago while they mended by firelight, in voices so soft they could hardly hear each other. After all, someone could be listening. Even though the hour was late, the night dark, and the nearest neighbor many acres away. “Aye, my mother,” Deliverance had sighed. “I do not understand the court’s authority. Goodwife Nurse speaks crossly to her husband when she cannot hear him plainly. Because she is old and deaf! How does that cause doubt about her faith in Christ and brand her a witch?” At these words, she had pricked her finger and dotted a linen napkin with blood. That could not be a good sign. “So why don’t good folk speak out in her defense?” She looked pointedly at her mother. Just remembering the conversation sent new chills of horror clamping at the back of her neck. Her throat tightened in a terrible strangle. First her mother had just shrugged, mitering a hem’s corner as neatly as always. As though these were ordinary times. Ah. Satan. The Dark One. The Prince of the Air whose latest converts had swung so clumsily from the tree. Shivering again in the near-dusk, Deliverance hurried toward home. Just up ahead was the pasture where the witch-sabbaths had been held. Or so Ann Putnam had said. As Deliverance approached, hundreds of spade-footed frogs started to croak loudly. Frogs! Fear rose in her gullet. To have this ruckus happen just as she walked by doused her with suspicion. She turned hot with terror. But Tituba had been spared from the gallows. She had confessed and repented. Cautiously, Deliverance turned her head to see if anyone noticed the noisy frogs. Any unusual gesture or thoughtless remark could be her doom. Her heart pounded. Almost as if the air had conjured her, Goodwife Putnam, Ann’s arrogant mother, stepped in front of her with a frown. Deliverance had no choice but to stop, bowing her head respectfully. “That is good. You are wise to remain a dutiful daughter. Otherwise, disobedience and sloth could bring about your downfall.” The woman’s nose lifted. Goody Putnam’s words turned to ice water the blood in Deliverance’s veins. The woman’s condemnations against the accused witches had been especially vicious. Was she now threatening Deliverance’s mother? Or did the goodwife consider Deliverance’s stroll a sign of laziness that would lead her into temptation? “I have my honored mother’s permission to stop at Goodman Crowninshield’s marsh for some medicinal herbs.” Deliverance lied, feeling queasy. Lies were a deep sin no matter the reason. Suddenly, she realized she had no real reason to be alone in the village and no recollection of how she had come to be here. The strange fruits bobbled in her brain. Her eyes crusted with the sands of sleep, and she scoured her lids with her fists. Deliverance turned from the woman, mindful that Goodwife Putnam’s words were somehow a threat. At least her daughter Ann was still Deliverance’s friend. For a little while, Deliverance had to escape the village. She couldn’t help it, chores or not. An amble through the marsh wouldn’t be amiss if she gathered up some useful herbs. But she must hurry. It was getting dark. Goodman Crowninshield often let her hunt for herbs on his land. His woods might have been a pleasant place to play, but children were not allowed amusement. No toys. Not Christmas. Since picking herbs was work, her walks through his bramble patches were permitted. She hurried away in the fading afternoon sun. In a sudden breeze, her cap bounced off her head, baring her bright hair. The color of hell fire. Many of the goodwives gossiped about her hair these days. Since the troubles had started, she was careful to watch her tongue and keep her hair carefully tucked away. One’s faulty appearance or improper actions could bring doom. Shivering, Deliverance reached for her cap, but it flew on the brisk air like a white bird, gliding past the grasping trees on Gallows Hill. If you take my life away, God will give you blood to drink! In her heart of hearts, she knew that yesterday’s five lost souls wouldn’t be the last. Who would be next? Herself? She glanced quickly behind her, but Goodwife Putnam didn’t appear to pay her and her evil hair any attention. And Deliverance still had the protection of Ann Putnam’s friendship. She was glad of that, for Ann’s cruel accusations had helped bring about yesterday’s hangings. As well as the first one in June. A tavern owner who had worn scarlet and lace and failed to attend Meeting. Goody Bishop had recited the Scripture properly and had nursed the sick during the smallpox, but none of that had counted. Deliverance shook her head to rid the ugliness and breathed deep. Swamp smells reached her nostrils, but she didn’t mind. Her feet hardly touched the ground. Finally, she reached Absalom Crowninshield’s woods. It was dark there, and she could hide for a while. With a grateful smile, she found a handful of feverfew waiting to be picked. Her excursion would be better explained. All of a sudden, both her footfall and her heart seemed lighter. The sweet sound of music rested on the air. She couldn’t help shuddering again, however. Other than the Psalter during worship meeting, music was considered frivolous. Deliverance didn’t think so, but after all, she had hell-fire hair. Maybe she was evil inside. She ran straight toward the sound just as a dark figure slipped into the trees. Without a thought, she followed—nay, she floated, not caring he might be the Dark One who lay in wait for the unwary along dim waysides. This sweet angelic sound cannot be evil, she told herself. The musician does not mean me harm! Yet in the back of her brain, she remembered the reverend’s words. The devil is never more real than when he seems an angel of light. Pausing nervously, she looked through the swamp maples and the fiddlehead ferns. Maybe demons did lurk behind the tree trunks. Almost without her approval, her feet began to plod slowly forward through the gloom. What if the Dark One himself stood ahead, waiting for her to sign his book? What if he took the shape of someone she knew so that she would trust him? The forest around her seemed endless and soon became swamp. Twilight swirled about her in a mist she could feel. She didn’t recognize this place. Maybe the Prince of the Air did live here, inviting his followers to unholy sacraments. Luring them to mountaintops to own all they could see if they followed him. She did not know. Although she was afraid, she moved through the dank air, almost unable stop on her own feet. The clearing ahead of her was one that she did not remember in spite of all her herb-hunts in these dark woods. Even in the dusk, the clearing was full of sunshine as if the treetops had a hole in them. The big granite boulders in the center of the halo of light were covered in moss and fern. A young man leaned up against the rocks, his profile to her. His long, white hands held to his mouth a fife of some sort. The notes he played invited her slowly toward him. She could not take her eyes from him, yet she did not trip or stumble through the roots. Her feet did not seem to touch the ground. Her long wool skirts did not catch in the muck. He wore a dark blue shirt, black trousers, a cloak that hung back over his shoulders, and tall leather boots. One foot stood firm in the muddy layers of decaying leaves; the other was propped against a small rock. His hair, dark as midnight, swung like a cape over his shoulders and hung to his elbows. While she approached, her heart pounded with the strangeness of the scene. He turned and stopped playing. His long hair covered the right side of his face, dividing it straight down the middle. He did not brush it away. Only his left eye showed; it watched her kindly, with gentle mystery, but he did not speak. Still he said nothing, and she gave in to the temptation to hear the music. “Please do not cease your playing. It is so lovely. I mean not to pry.” Her blood raced against the bones underneath her skin. As he hesitated, she felt relief. He was correct to stop. She was listening to forbidden music in a time of fear and death. She was in a place she had not known to exist before this minute. All of this was either a miracle or a spell. She prayed for a miracle, for a spell would bring death. “Good day, mistress,” he said finally. His voice was low with an unfamiliar burr. The left side of his face, the side that wasn’t masked by his hair, was beautiful. The half-mouth was well-shaped and rosy, the slender half of nose handsomely carved. He placed the instrument to his mouth once again and started a lilting tune. She could see that he held some sort of flute, handmade from a reed. La-a-a. La-a. La. La. La-a. La. La. La-a. La-a-a. Suddenly the dangerous sounds hammered into her. “Oh, no, you must stop! It is not wise. Someone might hear. These are strange days. Goodman Crowninshield is a fine man, but there are so many others...” She thought of Goody Putnam and reached to stop him. As he turned away, the long curtain of hair lifted like a bat stretching its wing. She saw the rest of his face, and gasped out loud. The left side of his face was as perfect as that of the alabaster saints the reverend railed against. The gray eye watched her with much interest. The right side was a twisted web of tortured flesh with a cold, dark hole that had once been an eye. Was he a demon after all? Was this good and evil combined? Her breath came out in loud heaves that she could see in the air. “Do not fear me,” he told her finally. How could she not? What if he was a spirit or a wizard? The prophet Isaiah clearly admonished against such a thing. But her left hand seemed to have a mind of its own. It reached for him. She placed it gently over what had once been a face almost as if she had done so many times before. Then he took her hand and placed his lips at her wrist. Her pulse jumped with life against his mouth, but she found a lump of fear in her throat as she tried to swallow. She turned from him, filled with interest but also with loathing. “Trust?” She wanted to escape. “Trust does not exist here in Salem Village.” For the first time, her feet seemed stuck in the mud. “I will find you, you know,” he told her confidently. Startled, she looked at him one last time. He pointed to the eyeless hole. “I am not blind. I see most everything.” Then his voice sounded sad. “But I cannot see yet if you are my doom or my deliverance. Maybe you are both. Or maybe I am yours.” With no other word, he turned and swiftly vanished into the evening trees. His deliverance? Her skin crawled, for he had spoken her name. At her feet lay the little flute. She grabbed it. Alone again, she turned and ran from Crowninshield’s woods as though the Dark One was right behind her.